Workers unionized for a variety of reasons, but the most pressing was their struggle to make ends meet. Dozens came forward with stories of choosing between rent, heat, and food; paying to come to campus often meant choosing not to eat that day. On top of their financial concerns, grads frequently felt disrespected as educators; some were even barred from speaking to their own students outside of class. Their commitment to their undergraduate students often went unrecognized, despite the role they frequently play as intermediaries between undergraduates and faculty. Significant increases in compensation: Graduate assistants across the University will receive raises in their per-course pay, ranging from 16% to 56% over the life of the contract. Fair Workloads: New caps on average weekly work will allow graduate students to balance teaching responsibilities, their own academic studies, and the second or third jobs that many work in order to make ends meet. Academic Freedom: Graduate assistants are now entitled to academic freedom in their professional capacity as educators, ensuring that they can provide the support and guidance their students need. Professional Development: Teaching development opportunities provided on campus will be extended to graduate assistants, rather than just faculty, helping workers develop their skills and improve the learning outcomes of their students. Employee Resources: Graduate assistants are now guaranteed access to the textbooks, tools, equipment, and supplies they need to do their jobs, ending the practice where some had to buy their own teaching materials. Improved Mental Healthcare Resources: Graduate students will now have improved access to mental healthcare services across campus, helping to reduce the stigma and other barriers that prevent some workers from getting the care they need. A True Voice on Campus: In addition to establishing a process for addressing problems that arise, the contract creates formal committees that will allow graduate assistants to work with the administration to improve working and learning conditions on an ongoing basis. These achievements are the result of ten months of bargaining between graduate assistants and administrators from the University. 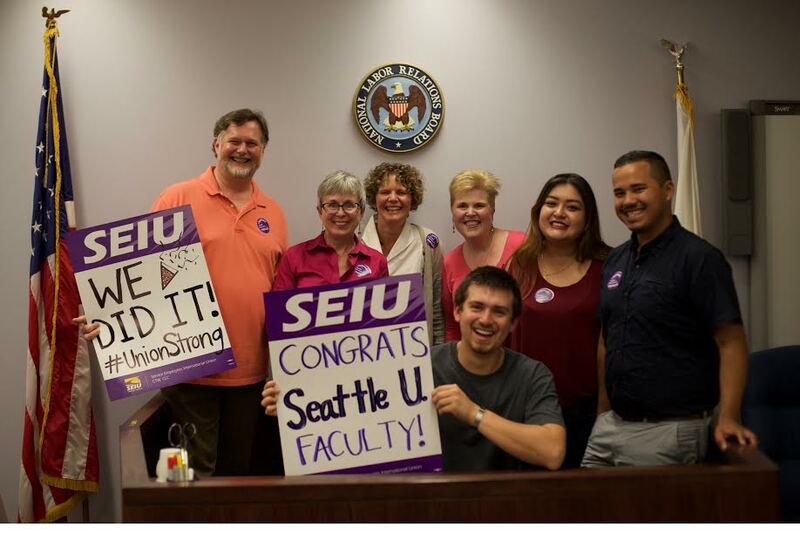 They will join the other members of SEIU Local 509 with higher education contracts, including part- and full-time faculty at Bentley, Boston University, Brandeis, Lesley, Northeastern and Tufts. Graduate assistants have also unionized at Tufts and are currently negotiating their first contract. The conclusion of these negotiations marks the end of the joint efforts of graduate assistants, faculty, undergraduate students, and community members to reach a successful agreement. Letters of support, hundreds of postcards, and the continued presence of allies throughout the campaign were instrumental in these negotiations. To arrange an interview with Brandeis graduate students leading the bargaining process, contact Megan Piccirillo at 973-668-8999 or mpiccirillo@seiu509.org.